Sometimes books are just too sad for me, and the reading of them is just like pulling the covers of someone else's misery over my own life, and even if I can appreciate the characters and the writing and the descriptions, it doesn't make me feel any better. 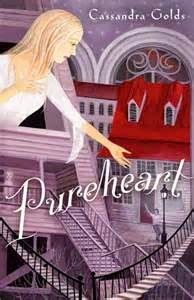 This was my reaction to Pureheart, by Cassandra Golds (2013, Penguin Books Australia). And there were no beautiful rainbows of warm snugginess at the end to cast a glow on all the sadness that had come before. In essence, this is the story of how a grandmother who hates with passionate intensity uses that hatred to chain her granddaughter Deirdre to her--using cruelty, expert psychological manipulation, and occult horror. Deirdre is trapped in the crumbling, insane old apartment building where departing tenants are never replaced until it is just her and her grandmother and all the stories of the miseries of the grandmother's life...and she has been so expertly molded with guilt and ignorance that she cannot believe that there is anything else in the world. Except. There is a boy, a cousin, who came to visit when she was five, and who she met again when they were twelve....and they love each other. But the boy, Gal (short for Galahad), is hated by the grandmother who forces their love to be a strange and stifled thing. Gal wants, desperately, to rescue Deirdre, but she is so tightly chained that she cannot believe it can happen. Then the grandmother dies, and Deirdre drifts on alone in the old crumbling building....and Gal comes to find her. But the grandmother is still there, as a ghost, and the Gal and Deirdre are caught in a fun-house of horror as she forces her memories of bitter sorrow and rage on them. So if you like dark, creepy, horribly sad psychological manipulation with a magical twist and an awful, cruel, rabbit death, this is the book for you!!!! You will admire the way layer after layer of twisted guilt and warped memories pile on, the way past and present are obscured and twisted in the narrative, the way the empty halls of the vast building lead nowhere, except when they are leading to dark secrets. Oh no! I don't think I could bear it myself, although I have no doubt it's well-written, etc. Seriously, no rainbows at the end? I have not read this book, but it sounds very sad. I don't think it is for me- only because I get to mixed up in super sad books, especially if there isn't a glimmer of hope at the end. I am glad I read this review. Thanks for sharing! Although your description "dark, creepy, horribly sad psychological manipulation with a magical twist and an awful, cruel, rabbit death.." sounds wonderful and I'm sure it has its audience, I'm out of Kleenex. I'm gonna have to pass but thanks for the heads up. So not in the mood for a sad book. Have to disagree with you on this one, Charlotte. I too hate books that are just miserable but for me this wasn't one of them. I loved the mystical, fairy-tale atmospherics and a wicked witch is just par for the course. Also, I found the ending uplifting even if it isn't exactly a standard lived-happily-ever-after resolution. I would urge your readers to give it a go. I want to read this, sounds marvellous. I don't like grim books without hope but this sounds promising.